If you’ve ever been stuck in traffic at the Borella kanatte (cemetery) junction, then you would have spent a few seconds drinking in the sweeping curves of the British School in Colombo. Set against the backdrop of other high-rise buildings, nestled in the heart of the city with the disparate worlds of the very much alive apartment complex on one end and the serene Borella cemetery on the other, the school is a familiar landmark for anyone on Elvitigala Mawatha. We meet the architect of the building at the school itself, and he looks around in satisfaction. Even today, in these times of starkly modern design with a penchant for the dramatic, the building retains an aura of grandeur. As the only purpose-built school in the country at the time, it set the bar high for construction back when it was designed and built in 2005. Almost a decade later the structure still stands testament to high standards of design strictly adhered to by Architect Rukshan Widyalankara who designed the building with input from J & I Architects, India. As a former President of the Sri Lanka Institute of Architects and present President of the Commonwealth Association of Architects Rukshan Widyalankara has already established for himself a legacy that will carry forward with the passage of time. A graduate of the University of Moratuwa, the architect formed Rukshan Widyalankara (Pvt) Ltd in 1995, a firm that has earned a name for simple, but striking contemporary architecture. “Ask any architect and they’ll tell you that it’s making a simple building that’s the most difficult task,” he says. The firm has been instrumental in the design process of several key projects including the Hemas Hospitals in Wattala and Thalawathugoda, the LMD House, several key public buildings, office spaces, resorts and factory complexes among others. Little surprise then, that he would become the youngest President of the Sri Lanka Institute of Architects in 2005 (he was 39 at the time). With his new appointment as the President of the Commonwealth Association of Architects (2013-2016) Mr. Widyalankara finds himself exposed to an interesting cross-section of architectural styles from five different continents, and maintains that Sri Lanka has very high standards in comparison with its contemporaries. they design, they must raise the bar they have already set for themselves even higher. This is why, he feels the British School remains to this day one of his most significant achievements. For the architect and for those that occupy its halls every day the building is not just a hallmark of modern architecture but a symbol of better things to come. “Few schools in the country are built to standard,” he comments. “With this building we wanted to set a precedent for very high standards when it comes to construction of schools. Perhaps we’ll see more of its type in the future.” After all, a school is where young minds are formed and futures are shaped, he smiles. Entering the premises from Elvitigala Mawatha you are immediately greeted by the expansive stairs that lead to the school’s entrance. Flanked by transparent glass on every side, this entrance leads to a reception area that used to be bare save a few couches but has now been supplemented with a reception office by the administration (the building was designed with a completely open entrance in mind but the idea was later revoked due to the dust and heat that made its way inside). The main block is centred by a large forecourt, evoking memories of a quintessentially Lankan ‘meda midula’. Although this might be about five times bigger and more minimalistic. “Our design brief was a little challenging,” says Mr. Widyalankara. “The school was to provide a peaceful, invigorating, learning environment for students. The challenge was in designing the building so as to echo the spirit of children and young people, aged from about four or five to their late teens.” The thoughtful architecture behind the grey and white tiled forecourt was certainly a starting point in encouraging a sense of togetherness among the students. During school hours and even afterwards this is where they interact, form friendships and share stories. The architect took particular pleasure in being given the freedom to design the entire structure in one phase. “Very few schools are built in one go”, we’re told. Most will phase out the construction-the process begins with one or two buildings and more are added to it with time. 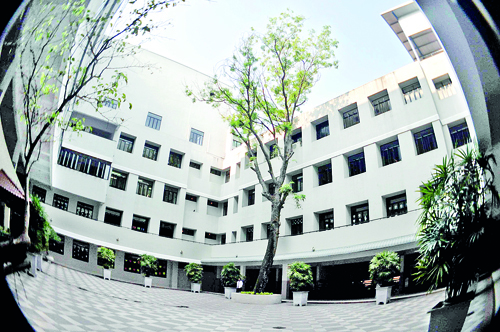 The administration at BSC, when they moved from their former premises in Kotte decided that they would build everything in one push so as not to disrupt the students with additional construction once the school year had begun. “It’s easy to envisage how a building will look like if you know you can get it done in one go,” says the architect. Moreover, the school was very clear with their requirement, he adds, acknowledging that this naturally makes any architect’s life that much easier. Built on a land of 319 perches the building is 203,000 square feet in area and is designed to hold about 1500-1600 people. Of them, about 1,200 make up the student population at present while staff members including teachers and administrative officials complete the figure. The special nature of the structure in that it would house a large population of young people engaged in learning activities meant that the architect had to adhere to a large number of international standards in designing the building. In addition the school was keen on being accredited as an examination centre for British exams, which meant certain ventilation, sound exposure and size requirements were also to be met. Of this, an important regulation was one specifying classroom size-in this case, 20 students per room. Even the corridors had to be of a certain width depending on the size of the classroom they led to. The building is centrally air conditioned while certain areas like the libraries and laboratories have special ventilation facilities to maintain humidity and temperature at a certain level. 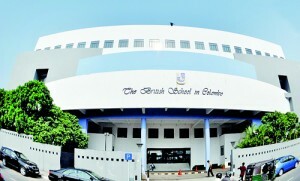 The school is the proud home of the British School Auditorium, a popular venue for plays, concerts and other shows (it was host to the Colombo International Theatre Festival just last week). 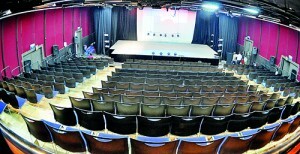 One of the few flexible theatre spaces in the country, the stage, seating and set up can be moved around to suit the user’s needs. It’s also soundproof, a plus if you’re rehearsing in the midst of a busy school day. The school-while using the best of design technology to mitigate the impact of the busy outside environ on its activities- is also conscious of its own input to the traffic melee that is the kanatte junction on a weekday morning and afternoon. Before the school was built traffic assessment was conducted to identify the bottleneck areas, and the addition to it by parents dropping and picking up their children. Following that an underground park to accommodate about 200 vehicles was built, and an alternate entrance was added. BSC is also home to a vast sports complex with an inbuilt swimming pool, gymnasium, basketball and netball courts and cricket pitch amongst others which seems to keep the students active. In accommodating the swimming area (a 25m long pool of turquoise tranquillity) into an already complicated structure Mr. Widyalankara and his team had to meet international regulations set by Fédération Internationale de Natation (FINA) which regulates competitive swimming practices. Most outdoor areas-especially the areas little children occupy-are grounded with rubberized material to minimize the risk of injury. “You can never be too careful,” says the architect. This is why windows are made of tempered glass, a toughened glass that breaks into small granular chunks instead of shattering into jagged pieces on forceful impact. There are entrances and exits everywhere we look, too, for quick evacuation in case of emergency. It meant going that extra mile down the path travelled by few but these were regulations that had to be met to create a space that was as safe as possible for the students, he says. For Mr. Widyalankara the building is testament to the potential a purpose-built school can have on its student populace. People often forget that the learning environment plays a major role in the impact of education on a child but it’s something more administrations need to consider, shares the architect hopefully. “Imagine if all schools were built like this,” he muses. Why I didn’t vote – and why that matters not!